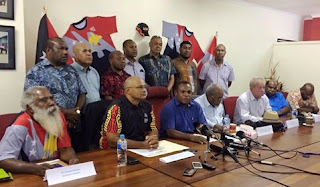 National Alliance (NA) Party has withdrawn as a coalition partner from the PNC-led government after their parliamentary party leader was decommissioned as Minister for Treasury by the Prime Minister. Party Leader Patrick Pruaitch told a media gathering today that NA party respected the decision by the Prime Minister and thanked the PNC led government for its confidence in the party as a coalition in the last 5 years. “It is time to break marriage with PNC and move on. I think it’s an opportunity for the NA to go to the polls and seek mandate from our people; that’s what NA is good at and we are moving on as a political party to win enough seats to form the next alternate government for our people.” Mr. Pruaitch said. He said the decision to withdraw from the government was reached by the Parliamentary Wing of the National Alliance party and the executives due to differences between himself and the PM on how to managed the country’s economy. 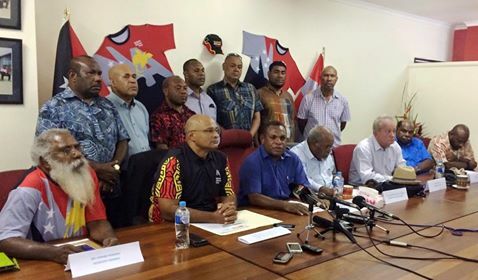 “As you know NA party is very supportive of stability in our country and we have stayed true to our word in terms of the Alotau Accord until recently when the PM and I had different views in managing the economy so I was sidelined.” Mr. Pruaitch said.